Christmas Lights: Should You Leave this Job to Someone in the Know? Using a Christmas lights professional to install Christmas decorations–including Christmas lights–can make the difference between ho-hum holiday décor, and décor that wows everyone who passes your home. And unless you are a real pro at this task, you should probably at least consider hiring a Christmas lights professional to handle your Christmas lighting installation. After all, you wouldn’t call a plumber to mow your lawn, or a doctor to cut your hair, would you? The first step to take when engaging a Christmas lights professional is to determine exactly what extent of help you need. Do you already know what you would like your Christmas lights and decorations to look like? In that case, you would probably do fine with the kind of company that only takes care of Christmas lighting installation jobs, such as hanging Christmas lights. Others provide a wide variety of services, from helping you select lights that suit your taste and budget, to choosing other holiday embellishments, to ensuring that your entire “package” of lights and other Christmas decorations look great together. Before settling on a specific Christmas lights professional to take over your Christmas lighting installation project, it’s prudent to ask each candidate a variety of questions so that there are no surprises later. For example, does the company provide any sort of guarantee that its team will arrive at your home on time and start hanging Christmas lights according to your agreed-upon design plan? How will the situation be handled should the initial cost estimate prove too low; in other words, will they consult with you to maintain a lid on costs? What happens should Christmas lights and/or Christmas decorations purchased from the company fail; e.g., will the company repair or replace it? 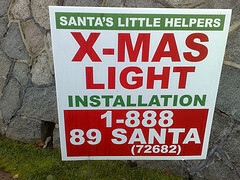 And perhaps most important, does the Christmas lights professional have liability and worker’s compensation insurance? It’s also important to remember that a reputable Christmas lights professional doesn’t disappear once a Christmas lighting installation has been completed. Rather, it should have in place a system for responding to follow-up inquiries and calls. The company should also provide, preferably in writing, a date or a range of dates on which it will return to your home to take down the Christmas lights (and Christmas decorations, if applicable) it has installed. Providing you keep these guidelines in mind, dealing with a Christmas lights professional should be a breeze.